From narration to content, this is a high-quality find in your search for the best apps for kids. Grandma’s Great Gourd is presented to us by Literary Safari Inc. 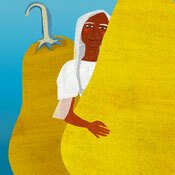 This book app is based on the children’s book, “Grandma and the Great Gourd: A Bengali Folktale”, a heartwarming tale. As an interactive storybook app, there are many bonuses. Early reading readiness is supported with the ‘Read for Me’ option and highlighted words. From there it’s on to physics based minigames. Kids can roll Grandma through the forest & unlock powerful gourds of different shapes and sizes! There is an option to personalize this app, providing an opportunity for quality time and a chance to open a dialogue with your charges. Kids choose from the existing sound effects and narration or record the story in their own voice. 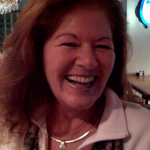 They can also pick a favorite relative, maybe one who speaks another language and easily record that. Note: We can’t record new sounds while recording the app but you’ll see the features in one of the videos. Just tap the red button to record your own sounds. This app is kid-safe and free of in-app purchases or ads. We highly recommend Grandma’s Great Gourd to Teachers for classroom use as well as home use for families. Consider putting together a gift package of great apps to gift to your favorite teachers over the holidays. Check out some of our other video reviews to help you decide. Be sure to check out the Meet The Developer interview below the videos. 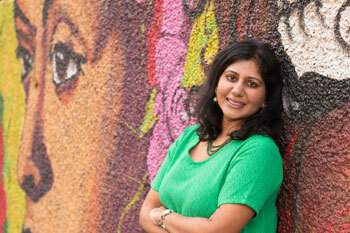 Sandhya, with Literary Safari, has a heartwarming message for parents and teachers. Literary Safari also gave us Dentist Bird, a West African Folk Tale. You can find that video review by using the search box on our site (upper right), It’s another ‘Best App’. “Kids need to be exposed not just to characters of color but also different cultural thinking and ways of problem-solving.” I keep these words of children’s book author Rukshana Khan above my desk and they serve as a daily inspiration to me and my company. My company Literary Safari started creating children’s apps in 2014 that celebrate literacy, storytelling, and diversity. A strong vision I had was to create a series of storybook apps, rich in gameplay, which bring alive folktales from around the world. I love folktales because they connect us back to the oral tradition of storytelling and allow us to explore themes and lessons of conflict resolution, empathy, and human nature without being didactic. I was born in Ghana, West Africa so we began our experiment with folktale-based apps with a story set in that region—Dentist Bird: A West African Folktale! After that, I went hunting for a great South Asian folktale from the part of the world that my parents and grandparents come from and I was eager to find a folktale with a human being as a protagonist, instead of just animals. As much as children need to be exposed to global storytelling traditions, I also believe that there is a need for more children’s apps that feature characters of color. Grandma’s Great Gourd is based on a Kirkus Reviews award-winning 2013 picture book Grandma and the Great Gourd: A Bengali Folktale by Indian-American author Chitra Banerjee Divakaruni. Grandma and the Great Gourd is a trickster tale from the South Asian region of Bengal (divided between India and Bangladesh) and I loved it because it pushes the envelope on the traditional trickster tales which usually feature animals who play tricks. This particular story has a human protagonist and I loved that our hero is not only a woman, but also a grandmother! I also chose it because it is a twist on familiar stories such as Little Red Riding Hood and Three Billy Goats Gruff which I thought would make the story more universally accessible, even if it comes from an unfamiliar culture. Grandma’s Great Gourd is a story rich with alliteration and onomatopoeia and that features some words in the Bengali language. While Bengalis are a large community here in the US and throughout the world—215 million people worldwide speak the Bengali language—it is an unfamiliar language to many users of the app. Throughout the development process, we asked ourselves two questions: (1) How can we bring alive a story from an unfamiliar culture with words in an unfamiliar language and use that to showcase and celebrate the commonality of cultures and experiences? (2) Is there a way to create screentime experiences that support joint engagement? In other words, how can we create an app that invites children and caregivers to play and read together on an iPad or tablet! On the heels of recent American Academy of Pediatrics new guidelines for screen time for young children, which recommended “co-viewing (with caregivers) as the norm,” the app features a recording studio where families can record special effects and narration for the game and story in their own voice or language. This is my favorite part. Research shows that the most important ‘interactive’ element is how an adult supports the child while using media, and we have designed Grandma’s Great Gourd to encourage just that kind of joint engagement, especially for bilingual families. We’re really pleased that Grandma’s Great Gourd has been featured by Common Sense Media on its “Best Book Apps for Kids” list and was awarded a “Best Pick App Award” by Tech with Kids. We imagine parents and grandparents sitting with their children and grandchildren to play around with the app’s features and using this story and its companion interactive experiences as a doorway to explore language, tradition, and culture—and to discover the commonalities between cultures! And, one side note, Grandma’s story is not just the stuff of folk and fairy tales. In 2015, a grandmother in Canada, lost in the woods with her loyal dog, came up with a clever plan to fend off a hungry fox in the woods!